Tony Stark: Iron Man Volume 1: Self-Made Man review – AiPT! In an all new body, with an all new mission, Tony’s looking to change what Iron Man means in this bold new era! Tony Stark has been through a lot. He’s been dead, alive and even comatose. Emerging from all of that, he’s built himself a new body, cell by cell, effectively becoming a self-made man, in every sense of the term. With all his experiences under his belt and a second chance at hand, Tony has a new perspective. He’s going to share Iron Man. 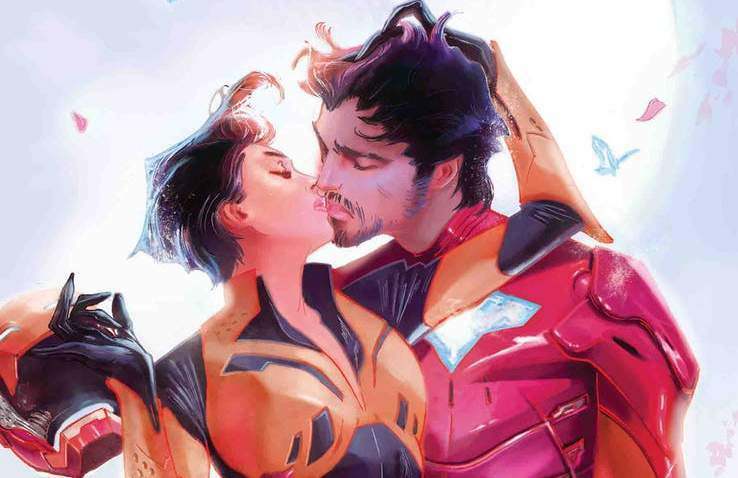 Dan Slott and Valerio Schiti, working alongside Joe Caramagna and Edgar Delgado, are leading Tony into a bold new era that not only feels reverent to his history but progressive, which is fitting considering the character’s role as a futurist. From the revamp of Bethany Cabe as Tony’s head of security to the return of Arno Stark, it’s a comprehensive look at Iron Man mythology across the ages, as well as wider Marvel machine mythology, that looks to push forward to new spaces and provide a fresh lens for audience everywhere. The tale begins as Tony visits an old acquaintance, Andy Bhang, who he’s now chosen to brought in to be his new robotics engineer. Bhang, an old man who once lost to a young Tony at an expo in his prime, is taken aback by the situation. And it’s very much through Bhang that we’re introduced to the elaborate and wondrous world of Iron Man, filled with talking cats, dogs and Iron Megazords. Unifying his brand under one umbrella, Stark Unlimited, Tony has built a think-tank to innovate further. Going by ‘Team Stark’, the ensemble includes more than just Tony and Bhang. There’s Jocasta, the once intended Bride of Ultron, patterned after Janet Van Dyne, who now operates as Chief Robotic Ethicist, ensuring Robots are given the same level of rights, dignity and fair treatment all sentient beings deserve. There’s Bethany Cabe, who operates as the Head of Security and there’s James Rhodes, who acts as Liason to the Armed Forces. With these individuals and many more at the helm, Stark Unlimited is Tony’s new vision for the future of the world. We’re all familiar with the iconic scene from the first Iron Man film, where Tony states to the press ‘I am Iron Man’. Slott and Schiti, with great purpose in mind, do a fantastic play on that sequence here to establish the new mission statement for the character and the story. Rather than utter those famous words, Tony tells the world ‘We are Iron Man’, because as he puts it, Iron Man isn’t just him, it’s not just a person, it’s an idea. This is really the driving engine of this run. The man known for his ego must share, it is no longer ‘I’, it is ‘We’. Slott and Schiti even re-frame Tony’s origin nicely in order to fit with this, with Tony exclaiming that in the past he was a solo-player but at his lowest point, in his case, in order to save his life, he had to learn to play well with others. Looking past himself to join with others is very much at the root of Tony Stark and the team really digs into that. The theme of second chances is also a hugely important one for Tony and having returned from his fall with an all new body, he leaps forward with renewed purpose and energy to change the world once more. It’s an approach that’s a bit reminiscent of Grant Morrison’s Batman, wherein the creators took stock of the character’s rich legacy and built a narrative around him embracing those around him, particularly with him sharing his resources and empowering others to join the crusade, no longer alone. While it isn’t quite Batman Incorporated, it’s in a similar space, which is a very good thing. It grants the run ambition, as it’s a massive saga built around examining character via a rich cast of characters that surrounds the hero, reflecting back at the core concept of the entire franchise. And that’s what makes this new look at the franchise so exciting, a really fleshed out cast of characters, a solid support network who inhabit and surround Tony’s world, making everything all the more meaningful. Bhang’s eye-popping everyman excitement, Jocasta’s stern dedication to her beliefs, Rhodey’s nervous out-of-place remarks, all make for a lively and incredibly funny book. Alongside all of them is also Amanda Armstrong, Tony’s biological mother, who brings another new flavor to the book, playing off both Tony and Bhang in fun ways, as a romantic interest develops between her and the latter. The book channels elements of works such as Black Mirror and Rick and Morty, as Slott promised, but within the first issue there’s also a sense of classic stories like Ultraman, with the kaiju battles evoking tokusatsu tales in charming and thrillingly bombastic ways. Schiti’s manga influences are also fairly evident and they fit perfectly into the mechanized world of Iron Man. Add to that the inclusions and revitalization of old characters like The Controller, Arno Stark, Sunset Bain and Machine Man as antagonistic elements and forces in the saga and you’ve got a winning book. Tony Stark: Iron Man is a delightful and delicious dive into both the character of Tony Stark and the advanced world of Iron Man and all that it entails. The ride to the future begins now, with all the wonders and horrors it may hold. But regardless, Team Stark is here with us to help ease the burden as the future arrives. Whether it be virtual realities, robot rights or philosophical questions about the nature of sentience, the team is here to tackle it all. Slott and Schiti have reinvigorated Tony Stark and the machine world of the Marvel Universe with great flair. This is everything an Iron Man should be and so much more. ‘Bill & Ted Save The Universe’ TPB review: Wyld Stallyns RULE!